Summary: Caroline’s day is unusual from the moment she wakes up. Her usually organized family is forgetful, and Caroline’s grandmother sends her to school without socks or a lunch. She’s distracted during the day, accidentally knocking a friend’s loose tooth out, playing with her food at lunch, and drawing an airplane on the wall at the end of the day. 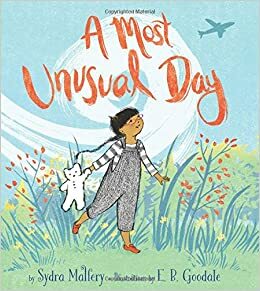 When her parents arrive to pick her up, she notices that her father’s glasses are taped and her mother is wearing mismatched socks. Then her mom reaches into the back seat, and brings out…Caroline’s new baby sister! The family is adopting a little girl. “This baby made everything, every usual thing, unusually new and perfectly right.” 40 pages; ages 4-8. Pros: Older siblings will appreciate this story, no matter how the new baby at their house got there. The illustrations are nicely diverse, both in their portrayals of Caroline’s classmates and her family. Cons: Young readers may not realize the new baby is adopted, as this has to be inferred from the story and pictures.